Woca Spot Remover removes grease stains from wood and many more stubborn stains. Eliminate water stains from wood floors and surfaces. The Woca Spot Remover is sold in a 9 oz aerosol can. Woca Spot Neutralizer effectively removes black wood stains caused by an acid/water reaction. Us this oxalic acid wood cleaning product on unfinished, soaped, oiled or waxed interior surfaces. Woca Oil Refresh is for regular cleaning and oiled wood floor care. This Natural Color used for natural oiled and color oiled floors. Effective Woca floor product is sold in a ready-to-use 32 oz spray bottle. Woca Oil Refresh is for regular cleaning and oiled wood floor care. This White Color used for white oiled and light color oiled floors. 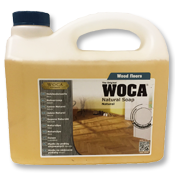 Effective Woca floor product is sold in a ready-to-use 32 oz spray bottle. Woca Oil Refresh is for regular cleaning and oiled wood floor care. This Natural Color used for natural oiled and color oiled floors. Effective Woca floor product is sold in an economical 1 Liter Concentrate. Woca Oil Refresh is for regular cleaning and oiled wood floor care. This White Color used for white oiled and light color oiled floors. Effective Woca floor product is sold in an economical 1 Liter Concentrate. Woca Natural Soap for periodic cleaning of oiled wood floors. This Natural Color is an oil soap for darker wood colors. The Woca Cleaner is sold in a ready-to-use 32oz spray. Woca Natural Soap for periodic cleaning of oiled wood floors. This White is an oil soap for white/light wood colors. The Woca Cleaner is sold in a ready-to-use 32oz spray. Woca Natural Soap for periodic cleaning of oiled wood floors. This Natural Color is an oil soap for darker wood colors. The Woca Cleaner is sold in an economical 1 Liter Concentrate. Woca Natural Soap for periodic cleaning of oiled wood floors. This White color is an oil soap for white/light wood colors. The Woca Cleaner is sold in an economical 1 Liter Concentrate. Woca Natural Soap for periodic cleaning of oiled wood floors. This Natural Color is an oil soap for darker wood colors. The Woca Cleaner is sold in an economical 2.5 Liter Concentrate. Woca Natural Soap for periodic cleaning of oiled wood floors. This White color is an oil soap for white/light wood colors. The Woca Cleaner is sold in an economical 2.5 Liter Concentrate.